Yikes! I can't believe I almost let this day end without realizing that it's the 147th anniversary of the Very First Train on the Valley Line! Yup - that's 147 years ago today July 29, 1871 - the first Valley Local polished the rails. I'm embarrassed that I wasn't able to put together a proper post, but that's ok - the fine folks over at ConnecticutHistory.org did it for me, as one of their "Today in History" listings. I've pasted it below for your convenience, but a link to the article on their site is here. Be sure to visit - there's LOTS of great stuff there. On July 29, 1871, a ceremonial train ran along the new 44-mile single-line track built by the Connecticut Valley Railroad. James C. Walkely, the president of Charter Oak Life Insurance Company in Hartford, received a charter in 1868 from the State of Connecticut to build this independent railroad from Hartford to Old Saybrook. Built along the west bank of the Connecticut River, it competed with steamboat service by providing a quicker overland route to Long Island Sound and connections to the steamboats that ran regularly to New York. 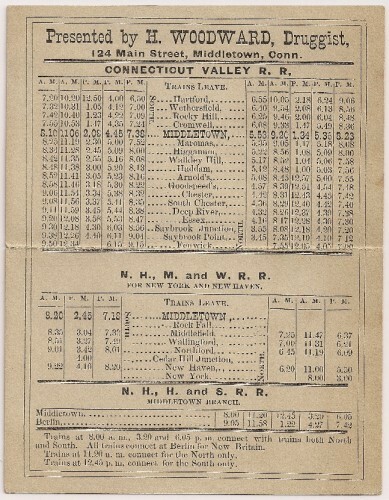 The daily schedule on the Connecticut Valley line in 1871 included four round-trip passenger trains and one train that combined passengers and freight, making 15 stops along the route, excluding Sundays. 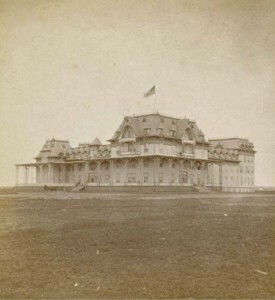 In 1872, the service was extended a half mile past Old Saybrook point over a trestle bridge to the village of Fenwick and Fenwick Hall, a resort hotel that had opened in 1871. Traveling from Hartford to Saybrook at the time took 2½ hours. Connecticut Valley Railroad was taken over in 1880 by the Hartford & Connecticut Railroad and eventually leased to the New York, New Haven, & Hartford Railroad Company.